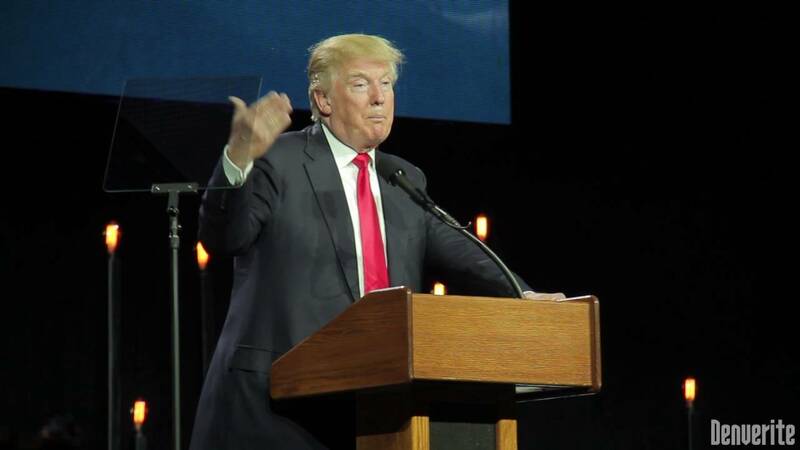 WATCH: Donald Trump at the Western Conservative Summit: "Hillary Clinton is a weak person." - Denverite, the Denver site! In his trademark style, Donald Trump riffed for a little less than an hour at the Western Conservative Summit. Everything was tremendous and amazing. Jul. 01, 2016, 12:53 p.m. 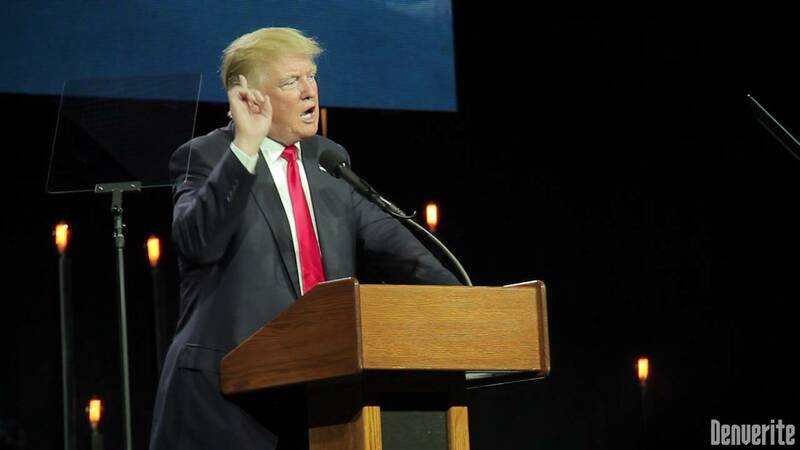 In his trademark free-association style, Donald Trump riffed for a little less than an hour on Colorado’s “rigged” caucus and convention process, free trade, the Iran deal, terrorism, immigration and jobs. Everything was tremendous and amazing. Underlying it all: America is going to win again, and win big, but only if he’s elected president. Trump ultimately drew a standing ovation at the Western Conservative Summit, the largest gathering of conservatives outside of Washington, D.C., from a crowd that included many people who would have preferred a different candidate. But the largest ballroom at the Colorado Convention Center was somewhere between half and two-thirds full and many local Republican politicians were absent. Word on the street was that Darryl Glenn, the Republican Senate candidate, was going to introduce Sarah Palin, who spoke before Trump, but Glenn did not appear on stage at any point in the program. A Trump pin on his lapel, Colorado Republican Party Chairman Steve House gave the introduction, but not before a long lag between Palin’s speech and Trump’s arrival. Trump appears here amid turmoil in his campaign, as two top staffers who had only recently been hired quit, and as he tries to develop an organization in battleground states like Colorado. After his speech, he headed to a $10,000-per-couple fundraiser put on by beer executive Pete Coors and former Broncos coach Mike Shanahan. Trump started off talking about the “rigged” system in Colorado that led to his rival Ted Cruz winning all the state’s delegates at the state convention. This is rhetoric that hasn’t always sat well with Colorado Republicans — at least not the ones who participated in that system. But when Trump talked about the need to be tough on ISIS and tough abroad and what he perceives as the fundamental weakness of his Democratic opponent, he clearly touched a nerve in the crowd, which was on its feet cheering.